Independently carry out research and advise the Office on global and regional trends pertinent to the four Challenge Domains of ISC. Analyse areas where ROAP’s role is most effective and lead the strategic planning process under the guidance of the Director and map the actions that should be taken for particular Challenge Domains. Assist ISC ROAP working groups to produce analysis and reports on policy recommendations and initiatives for policy makers, civil society and other stakeholders at national and international level. Articulate ISC/ ROAP’s vision and mission to a wide spectrum of audiences and curate ROAP’s substantive content on its website as well as social media platforms. Devise creative ways of engaging funders and stakeholders at substantive and administrative levels. Design activities that bring different groups together in order to effectively produce ISC outputs. Assist the ROAP Director in coordinating the day-to-day activities of ROAP which include managing meetings and strategic workshops as well as report/minutes writing. Resourceful and capable to review and synthesise large amounts of literature and complex information, ask strategic questions and produce high quality actionable insights. Knowledge in policy, economics, and/or other social science issues relevant to the four Challenge Domains. Data visualisation and database management are added advantage. Excellent interpersonal and communication skills, both in Malay and English languages. The working language of ROAP is English. Sound judgment, tactful and sensitive to diverse cultures. Strong organisational skills, capable of working in a fast-paced environment, ability to work autonomously, and to multitask (i.e. plan and coordinate multiple projects) within established deadlines and parameters. Ability to work at all levels including government officials, experts, senior management, stakeholders and across multiple functions/ departments/ organisations. Masters in science, science policy, economics, social science and other related fields with at least 5 years of work experience. PhD in science, science policy, economics, social science and other related fields. This role requires frequent international travel. 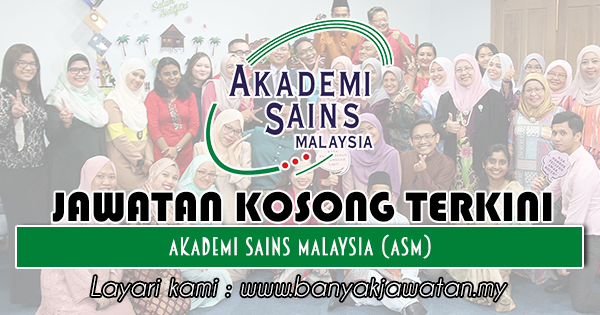 0 Response to "Jawatan Kosong di Akademi Sains Malaysia (ASM) - 18 Januari 2019"